Most people expect the main sources for stress in the workplace to be work overload and time pressure. The InLoox Work-Life-Balance Survey, however, shows that appreciation, or a lack thereof, has a much bigger impact on job satisfaction and stress levels at work. Everybody knows that constant stress can hamper your productivity and in the worst-case scenario, it can also lead to a burnout. Stress can be considered a ‘widespread disease’ in today’s society. Businesses and their employees are under constant pressure to deliver bigger and better results in the fastest time possible, which of course causes a high amount of stress for everybody involved. This is why we decided to conduct this survey to find out what the main sources of stress in everyday work life are. 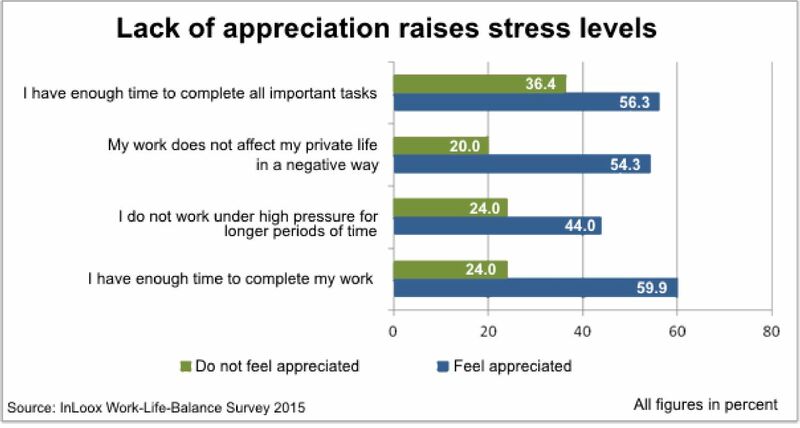 A perceived lack of appreciation in general raises stress levels whereas those that felt their work was being valued are less likely to suffer from stress. A majority of participants who feel underappreciated at work (80%) state that this fact also has a negative impact on their private lives. Only about 51% of employees feel that they can finish all important tasks with sufficient time and without interruption. 20% of employees already feel exhausted in the morning and the same number are afraid of suffering a burnout. More employees (60%) than supervisors (54%) feel that they have to work under constant pressure for longer periods of time. We also found out that there are big differences between employees and supervisors in terms of job satisfaction, contentment with their own work and time pressure. Surprisingly, more responsibility does not correlate with more (perceived) stress. Supervisors are in general more content with their work performance and had a more positive perception of the work environment. On the other hand, employees are less satisfied and feel more burdened by their workloads. Almost all supervisors (98%) feel that their work is being valued and 85% are content with their wage. In contrast, the numbers of employees who feel their work is being valued is smaller (83%) and only around 60% of them are content with their income. Similarly 70% of supervisors say that they feel that they have reached valuable professional goals, whereas only 45% of employees feel the same. 45% of employees also feel less productive now compared to past years. In contrast, only 30% of supervisors share the sentiment. The results of our survey show that time pressure and high workloads affect perceived stress levels much less than a lack of appreciation. Therefore, the main cause of stress in the workplace is the human factor. A lack of appreciation has an overall negative impact on job satisfaction and this negative effect even extends to employees’ private lives. This means that it is very important to create a working environment that is based on mutual respect and appreciation, because then even the most high-pressured situations will seem far less stressful. For managers and team leaders this means that they should not be too stingy with praise when employees and team members have delivered great work. 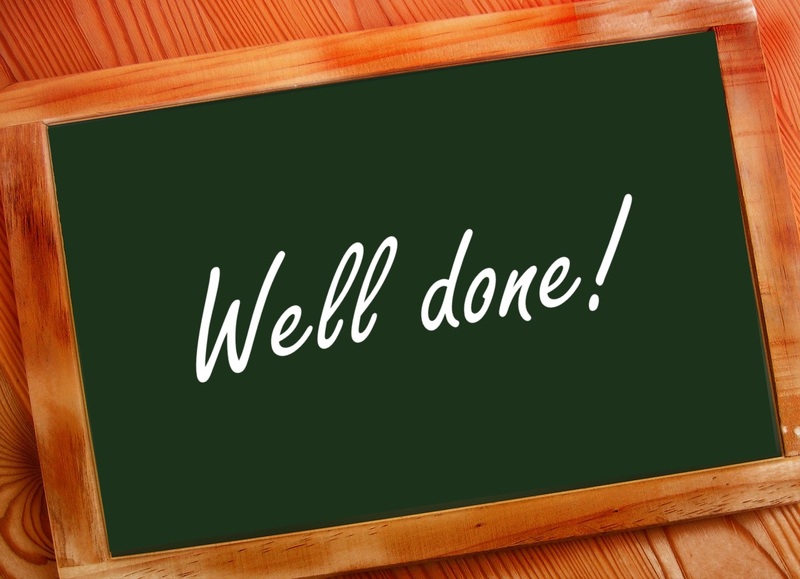 A simple “thank you” and “well done” can be a big motivation and stress reliever. Employees in turn should not be afraid to ask for acknowledgement when they feel that they have earned it. A Simple “Well Done” Can Have a Powerful Impact on Job Satisfaction - InLoox • Copyright 1999-2019 © InLoox, Inc. All rights reserved.